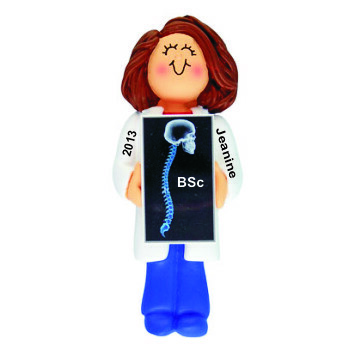 Celebrate her fantastic achievement and offer best wishes for a great career with the chiropractor school graduation gift idea female brunette personalized Christmas ornament. The interesting design is entirely handcrafted including the name, year and degree that we hand letter onto each one. These graduation ornaments personalized to make them memorable ship in our custom velvet gift bag with a cord already attached for displaying wherever it makes her happy! The brunette female chiropractic school graduation personalized Christmas ornament will put a smile on her face whenever it is received.